Leave it to Gypsy Sport to bring the noise to the first ever New York Men’s Fashion Week. 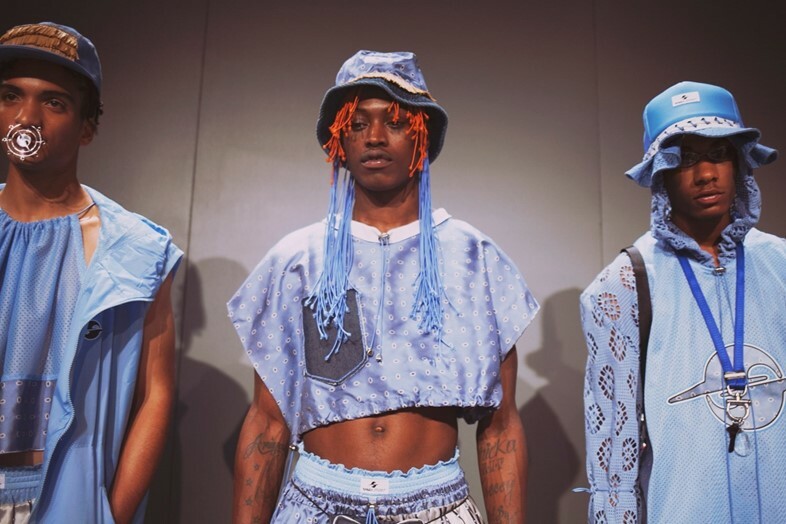 Storming the official venue at Skylight Clarkson Square last night for their SS16 show, a gang of baby blue and pink-clad urban warriors – trimmed with raffia and adorned with cowrie shells – each took turns hitting center stage, busting moves and striking poses. The brand may have ditched the impromptu (and illegal) street show of seasons past to go on schedule, but they haven’t toned things down, retaining their Harlem roots with an insane jungle vision of back to school swag. Think tiny drawstring backpacks, high top sneakers, fringy basketball net tops and raffia trimmed caps, as designer Rio Uribe channeled a majorly off-kilter 90s flashback, back to the days when kids wore oversized basketball gear, cowrie shell chokers, key ring lanyards and bungee cord pants. In true Gypsy Sport style, the collection was offset with a masculinity-warping daintiness, featuring crop tops hung with chandelier crystals, a baby blue granny-knit hoodie and bubblegum pink ruffles and wide flares. 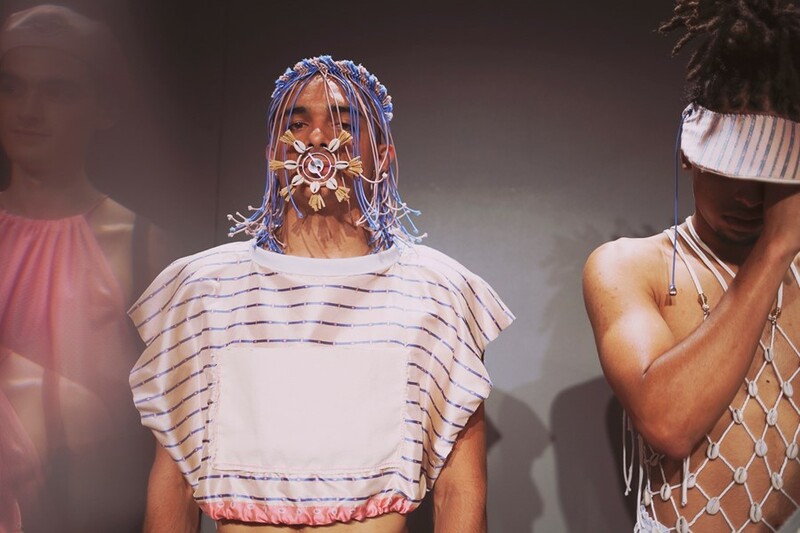 Jewelry designer and longtime Gypsy Sport collaborator Chris Habana’s striking septum piercings reeled in the fierceness with his oversized pieces embellished with acrylic nails. Uribe promised big things to come back in February, and yesterday he delivered with a special announcement after the show: Anna Wintour named Gypsy Sport as a finalist for this year's CFDA Vogue fashion fund. It’s a refreshing bid for diversity and an optimistic outlook for New York’s rise as a creative fashion capital once again, as it continues to support and bring up a wild new generation of designers. Read our longread feature on Gypsy Sport here.